Many of our favourite items can be personalised with your own choice of name or title. Boxfiles, Lever arch files, ring binders, individual book safes or desk blotters. Our range of ledger boxes are very popular, they look fabulous and people always need box files. 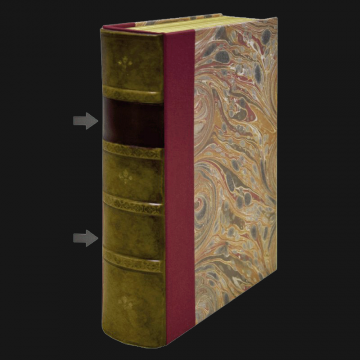 They are now available in an even wider range of spine colours with various label and lettering colours also available and we have recently added two new book-style cover patterns as an alternative to the marble effect: Baroque & Dappled (see 'Avail.. Height: 10mm / 0 3/8"
Avoid tell-tale ring marks on furniture with these very sophisticated drinks costers. Each one is fashioned to look like a mini book.This item can be personalised to your specification. Personalisation will be the same for all 4 coasters in the set - if you require a logo to be engraved please contact our office direct.PLEASE NOTE - Personalisation.. 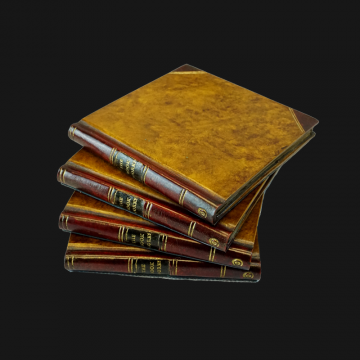 Height: 310mm / 12 3/16"
Depth: 260mm / 10 1/4"
The title on this ringbinder is from a genuine antique leather book entitled Art Journal. If you would like your own engraving please call us to arrange this for a small additional charge. 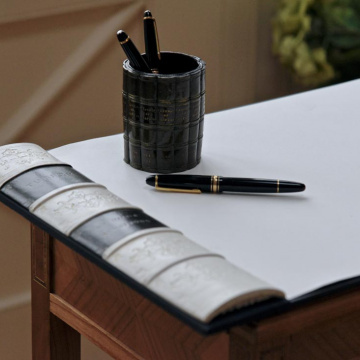 This A4 ring binder brings a touch of elegance to any home or office. 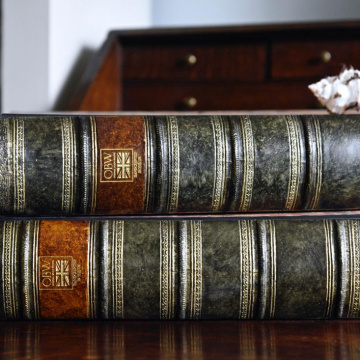 Do-away with unsightly filing and replace it with rows of beautiful antiquated books. 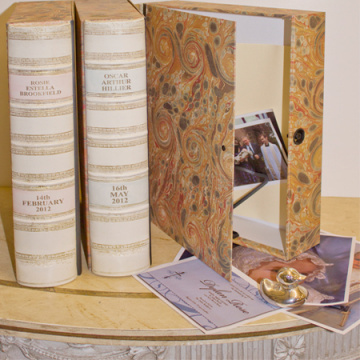 ..
Our range of personalised ledger boxes look simply fabulous and has been extended to include a box especially for weddings. 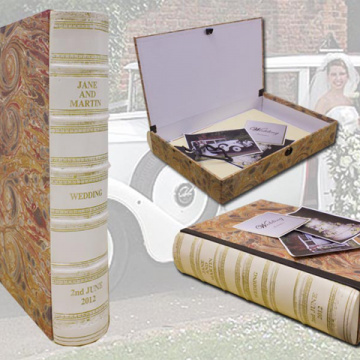 The wedding box is available within our vellum spine colour. 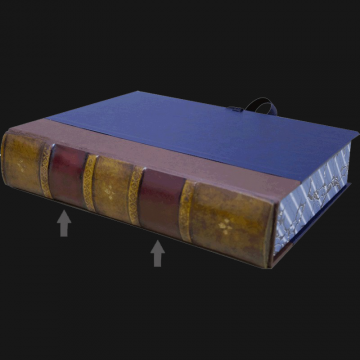 We can personalise the spine to your requirements, with names, dates, locations, etc. 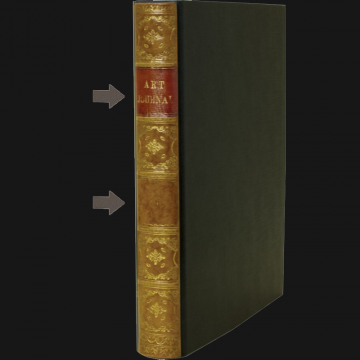 Click on the colour and add your custom spine title to the order. If ordering m..
Our range of personalised boxes look simply fabulous. Our most recent addition is a baby keepsake box. This is a wonderful place to keep birth congratulation cards, perhaps Christening Keepsakes or naming ceremony memorabilia. There is room for newborn photos, birth identity bracelets, 'first shoes' and many more treasures that can be kept in one p.. Ideal for storing your favourite magazines. If ordering more than one special title, when asked, click confirm and then begin to enter the details for your next personalised engraving. For logos or further assistance, please call 01285 641 664. 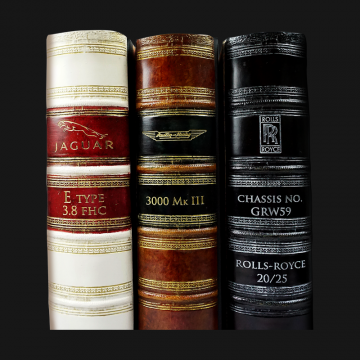 ..
Classic document storage for classic car enthusiasts and owners. We love your car so much that we have decided to commemorate your ownership with the “personalised” box file - your car deserves it! It’s one of the family. We can personalise with your name, the cars name - Registration Number an..
A versatile book box for a special gift or keepsake. This handmade book box, made in England to our specification, is of strong construction with striking blue covers and elegant ribbon ties. 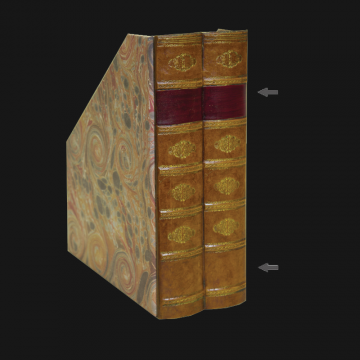 At A5 size, it fits neatly into a book case or looks great as a coffee table piece. Suitable for a whole range of paperwork or memorabilia – we know customise..
Width: 54mm / 2 1/8"
A place to hide away your treasures with your own choice of title. Easily slipped in amongst your other books on a book shelf or kept safely at the bedside. 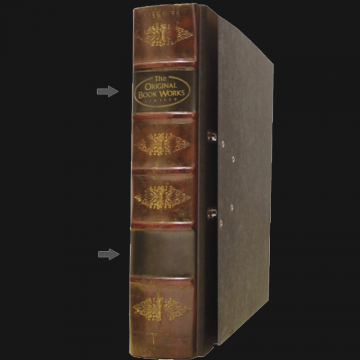 This portable book safe is an ideal solution for keeping small household items safe – passports, cash or jewelry can be accommodated. Made of sound steel construction, 2 keys are supplied with .. Height: 7mm / 0 1/4"
An exceptional desk top piece which elevates the look and feel of your home office or study. Equally suitable for the office or boardroom. This handmade blotter, made in England, is designed to be used with ease with plenty of even writing surface available to you. Supplied with blotting paper in place (easily replaceable), the personalised blotter..
Store away your mountains of filing with our smart lever arch files. 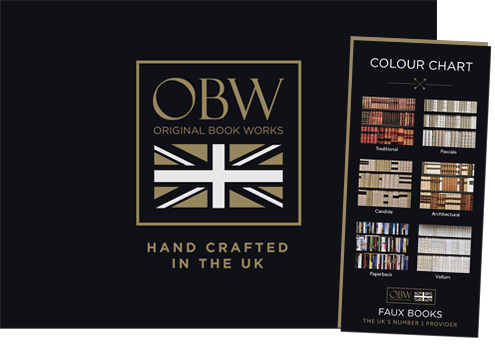 They come in a selection of titles and 5 spine colours with a choice of contrasting back ground labels behind the gilded text. If you are looking for a way of keeping the notes and paperwork for your special interest together, these personalised lever arch files are ideal. We h..